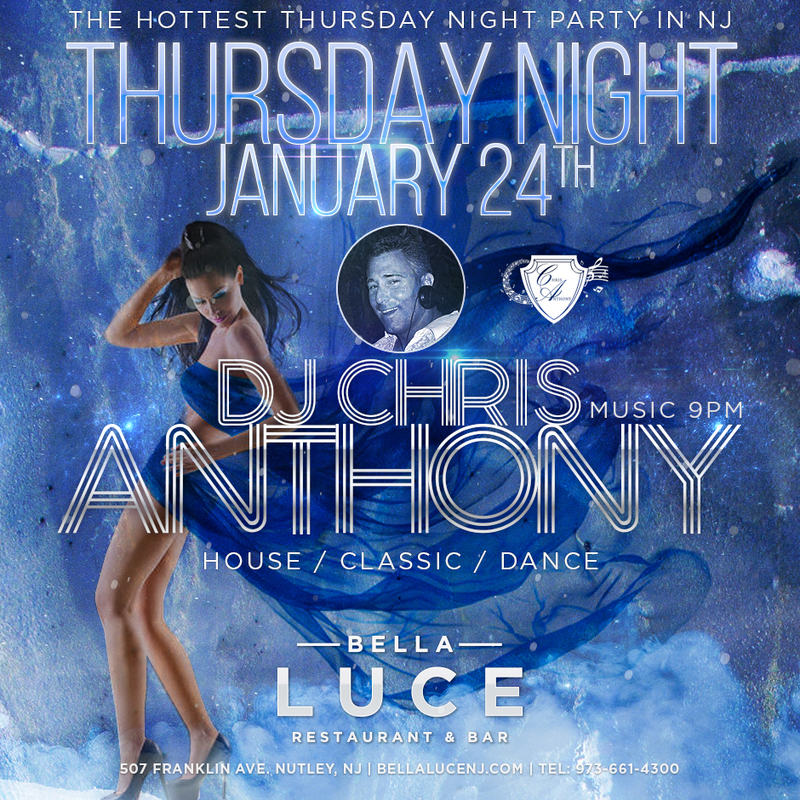 Don't miss DJ Anthony 'D' (Decclessis) at Bella Luce as the hottest Thursday Night Party in Northern NJ continues through February. 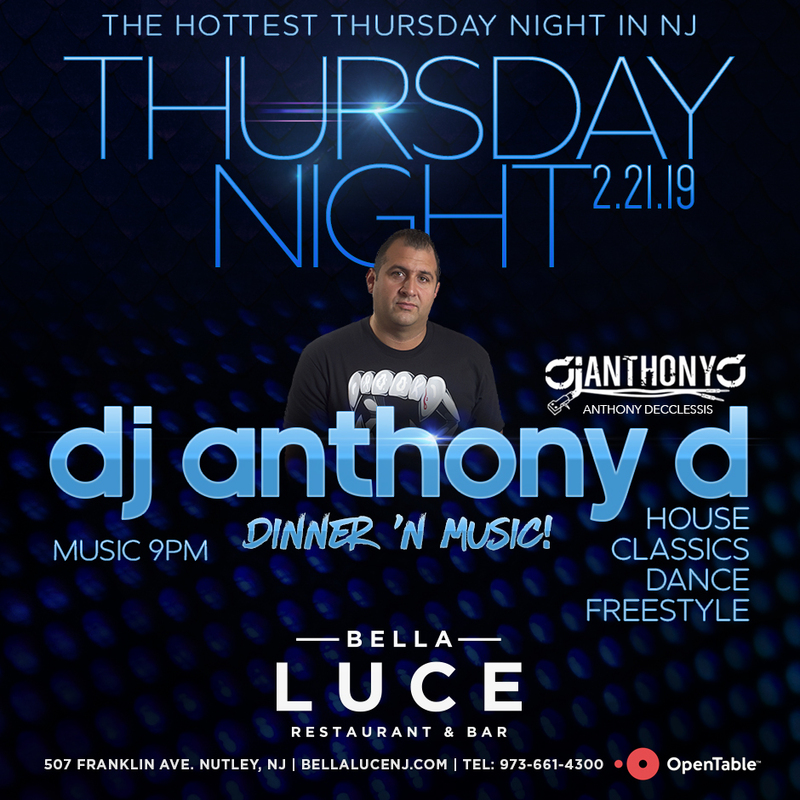 DJ AnthonyD will be spinning the hottest house, classics, dance, and freestyle tracks on Thursday, February 21st, 2019. Music starts 9pm. Arrive early for dinner and experience one of Chef Erm Firmani's amazing dishes. Make your dinner reservations today, call 973-661-4300 or book online. Let us know if you're coming here. 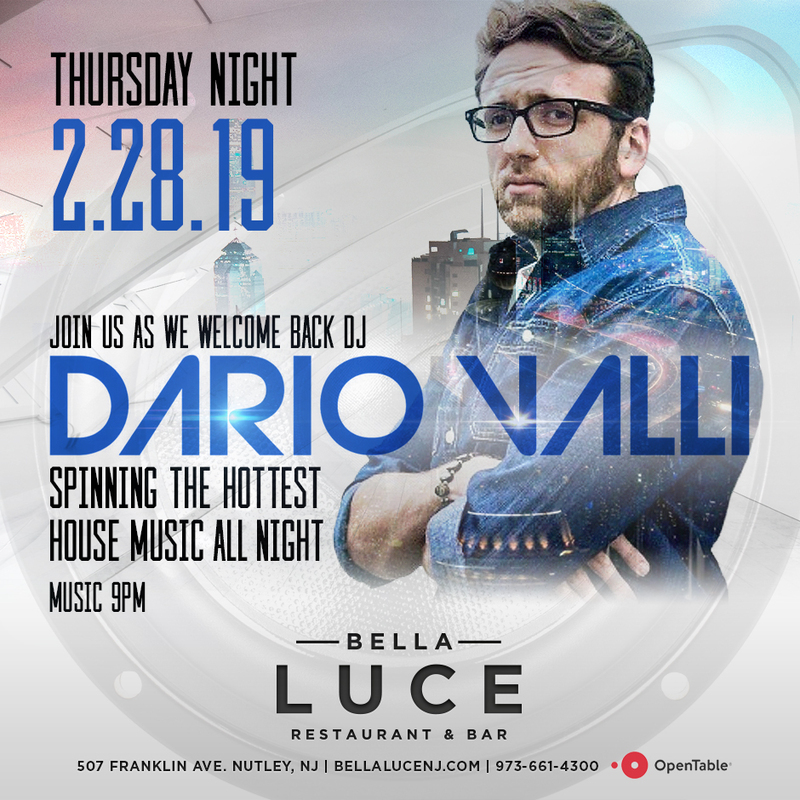 Bella Luce is pleased to welcome back DJ Dario Valli on Thursday Night, February 28th, 2019. Don't miss DJ Dario as he spins the hottest house and dance tracks throughout the night. Make your dinner reservations online. Let us know if you're coming here. 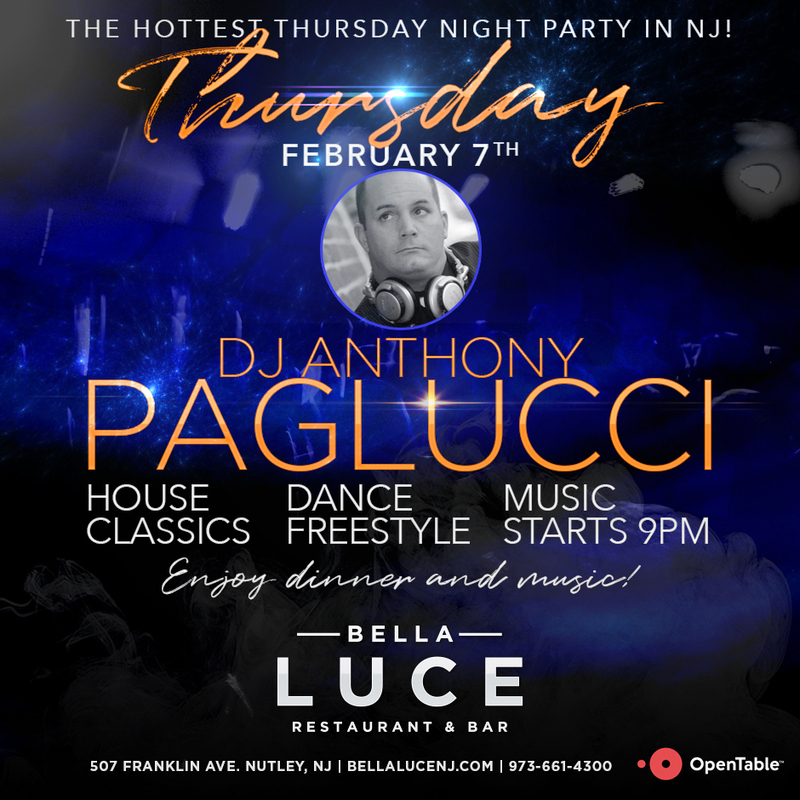 Experience Northern NJ's Hottest Thursday Night Party as DJ Anthony Paglucci spins the hottest 70s, 80s, 90s, classics, freestyle, house, and dance music on Thursday, February 7th, Music starts 9pm. Visit us for a delicious dinner by chef Erm Firmani or stop by for some amazing cocktails at our bar. Make your dinner reservations online, click the find a table link at the top of the page. Let us know if you're coming here. 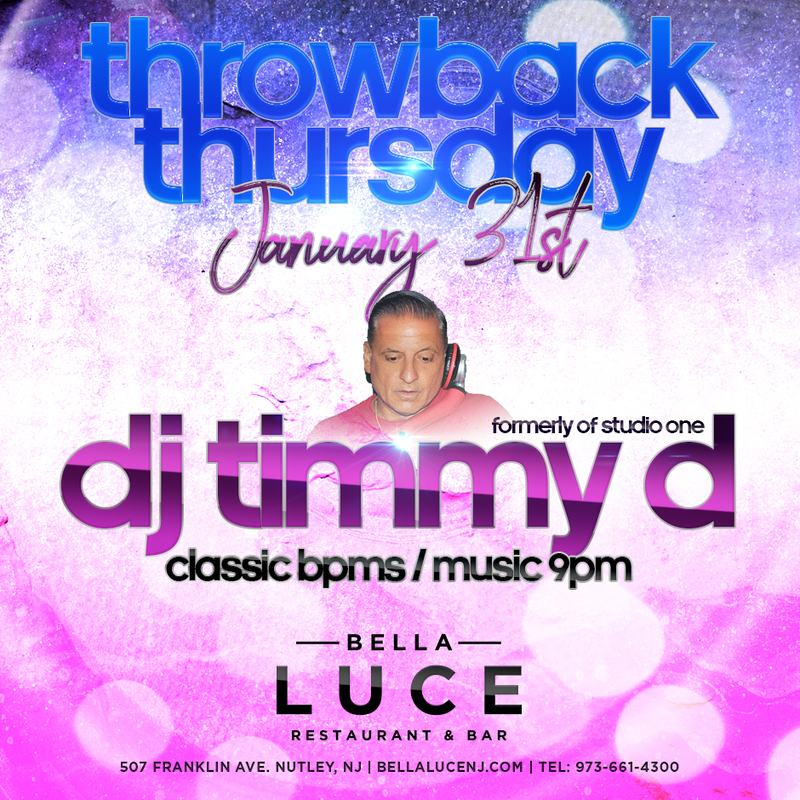 DJ Timmy 'D', past DJ at some of the area's hottest nightclubs including Joey's (Clifton), Studio One (Newark), Parrilos (Belleville), and Butterfields is back with 'Throwback Thursday' at Bella Luce on Thursday, January 31st, 2019. Don't miss a great night out as Timmy spins the hottest classic BPMs and soulful house. Music starts 9pm. If you haven't tried one of Chef Erm Firmani's amazing dishes, make your dinner reservations today! 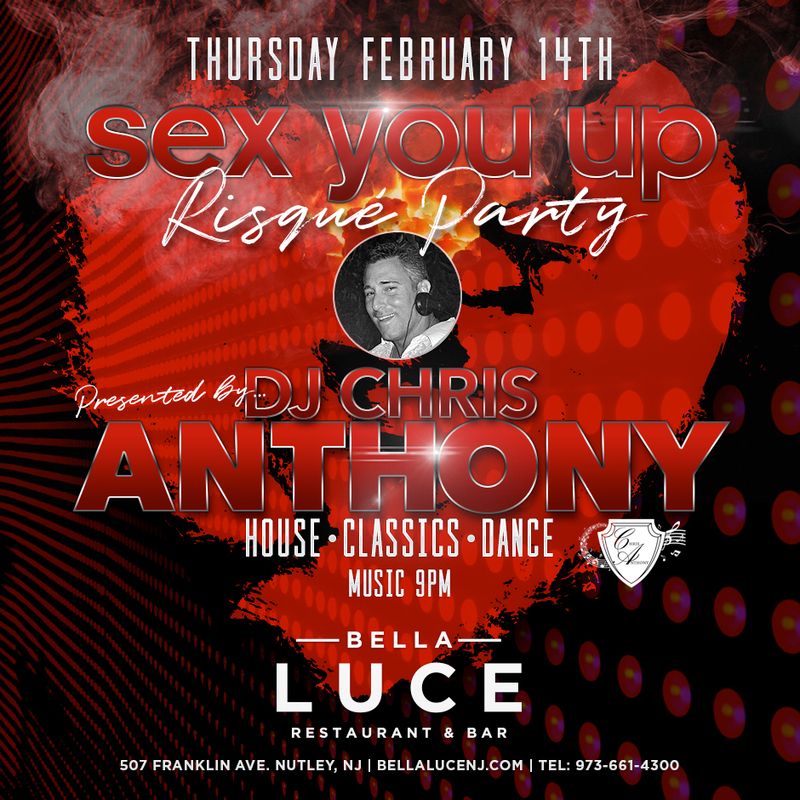 The hottest Thursday night party continues at Bella Luce! 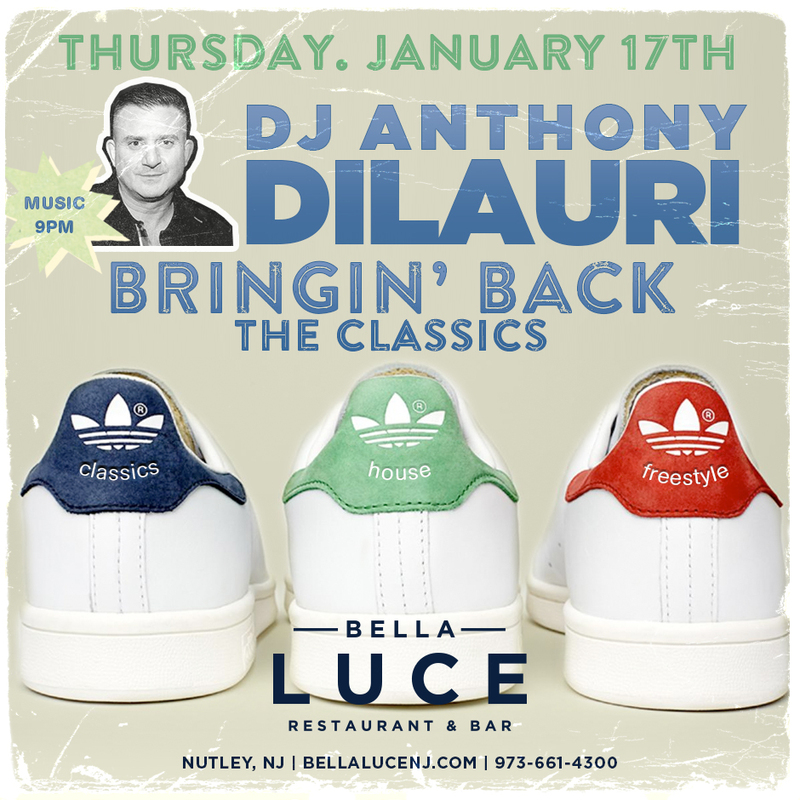 On Thursday, January 17th, don't miss DJ Anthony DiLauri 'Bringin' Back the Classics' spinning the hottest classics, house, disco, freestyle, and dance music. Music starts 9pm. Let us know if you're coming. 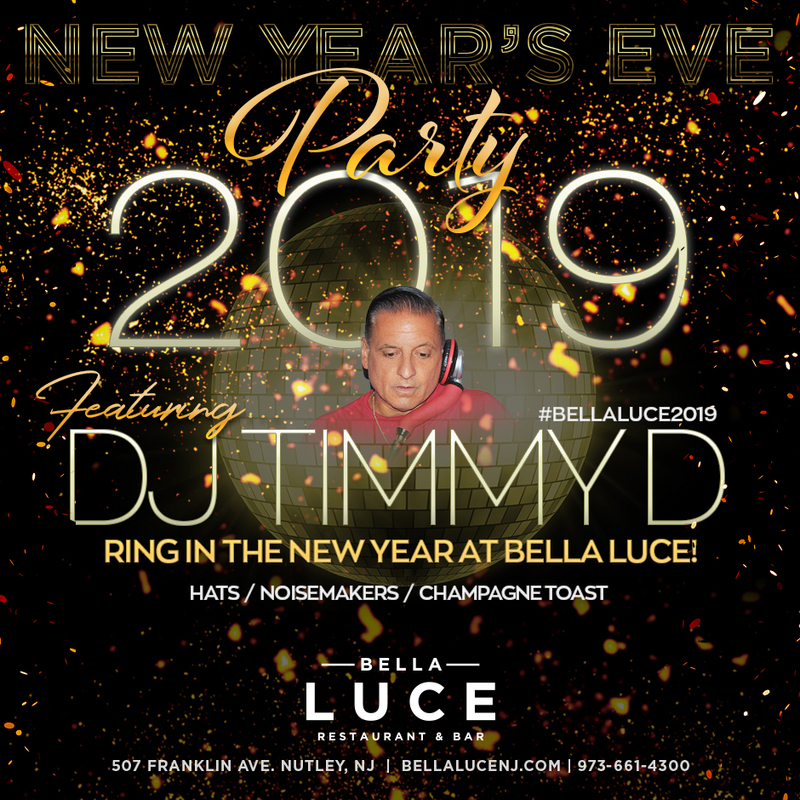 On Thursday, January 10th, Bella Luce welcomes back DJ Anthony Paglucci in his first appearance of 2019! 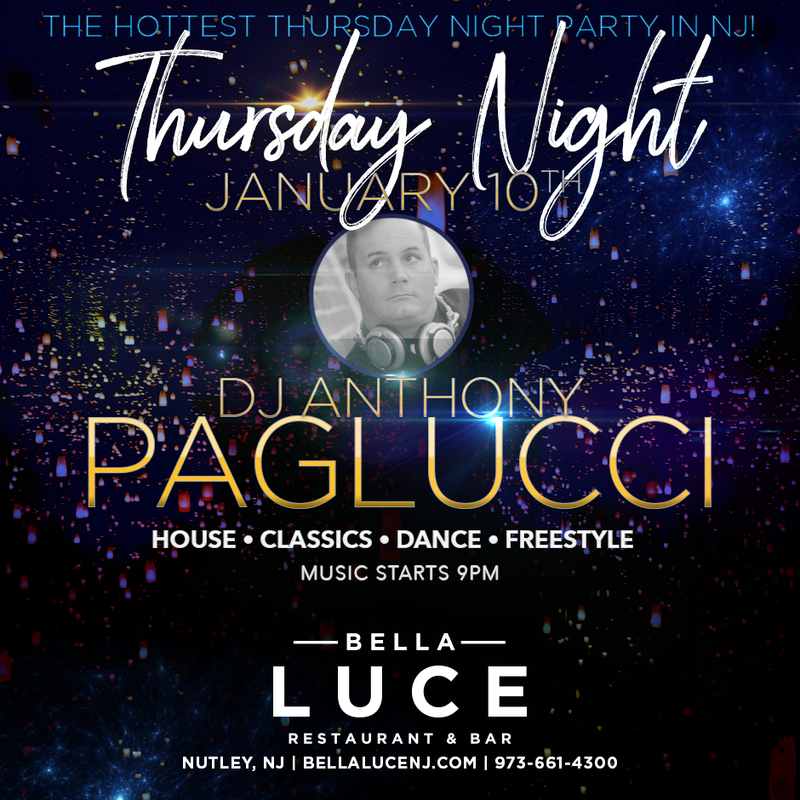 Check out Northern NJ's Hottest Thursday Night Party as DJ Anthony Paglucci spins the hottest 70s, 80s, 90s, classics, freestyle, house, and dance music. Music starts 9pm. Visit us for a delicious dinner by chef Erm Firmani or stop by for some amazing cocktails at our bar. Let us know if you're coming here. Happy New Year. The hottest Thursday Night Party in NJ continues in 2019. 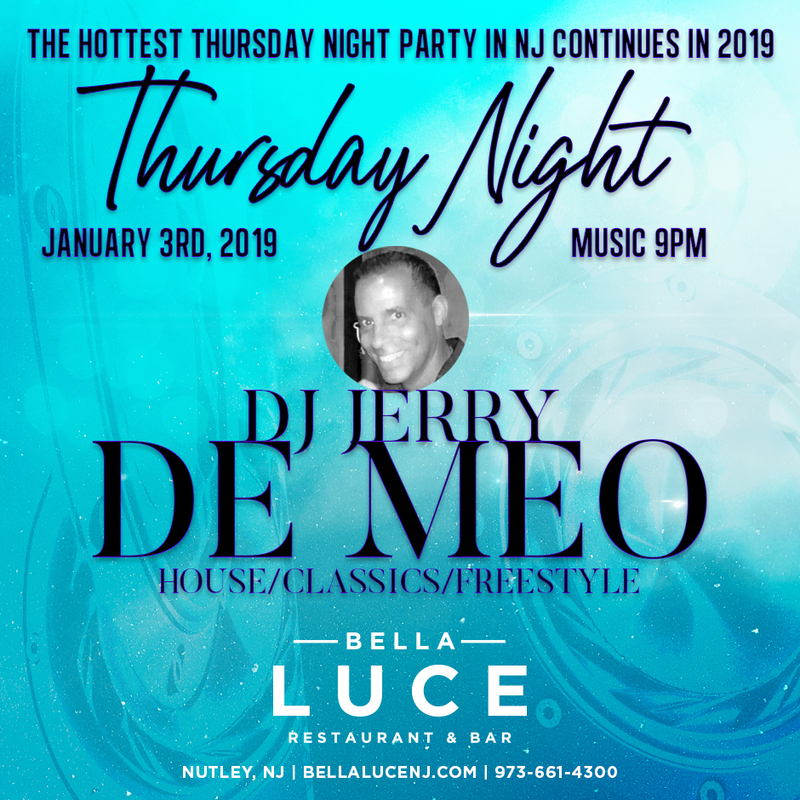 DJ Jerry De Meo will be spinning house, classics, dance, and freestyle starting at 9pm on Thursday, January 3rd, 2019. Don't miss a great night out for drinks and dinner. Arrive early for dinner and experience one of Chef Erm Firmani's amazing dishes. Make your dinner reservations today, call 973-661-4300 or reserve online. CLICK HERE TO LET US KNOW IF YOU ARE COMING! Stop looking for a place to go on New Year's Eve! Bella Luce is the perfect spot for dinner or drinks this New Year's Eve. Ring in the New Year with complimentary party hats, noisemakers, and a Champagne toast at midnight. DJ Timmy D will be spinning the hottest tracks! Make your dinner reservations fast, seating is limited! View our New Year's Eve Dinner Menu (PDF) Coming to the party? Let us know here.